We require a deposit to hold a puppy for you and we only take cash at the time of pickup. All of our puppies will carry our kennel name on the registration papers. However, you may call your dog any name you want..
Our "A" Litter-All pups must have an "A" name on the AKC paperwork. More to come...Super nice litter coming. Both dogs are huge bone and awesome temperaments. an "B" name on the AKC paperwork. Super nice litter coming..Both dogs are very thick boned and really nice heads. Fritz is the son of World Ch. Blade Von Grossen Tal. Art is a Serbia import. Please contact us before making any payments to us to ensure that we have puppies available. We have already added the fees to the payments. That is your cost, and the fee to send through paypal will not be applied to your deposit. We have a lot of money, time and investments in our dogs. Our dogs are apart of our family and only want the best homes for their offspring. If you are looking for a great bred Rottweiler with great sound temperaments and working abilities, then we are the breeder for you. We occassionally have pet quality pups, pet quality pups already has a flaw and cannot be bred at anytime of it's lifetime, nor can it enter any shows and it must be spayed/neutered at the appropriate age. We feel blessed to have the German and European bloodlines that we have in our kennels. We strive to produce the best puppies that we possibly can for our buyers. 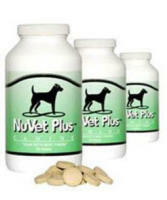 We also have our dogs hips certified by the Orthopedic Foundation for Animals. If you wish to purchase one of our puppies please contact us directly at [email protected] or 704-279-5743. If you put a deposit down on one of our upcoming breedings, we assume that you are ready for a rottweiler puppy and everyone is in agreeance on this matter. We don't offer refunds on deposits. Deposits are non-refundable. All Puppies are sold under contract and is strictly enforced. Please read over ourContract before you even contact us about a puppy. Please note, that we will not place a puppy with you unless you are willing to have the time to raise a puppy and have it for its lifetime. You must make sure that this is the Breed you want in your life (make sure you read About the Rottweiler). This dog will be a great and loyal companion, but it requires effort on your part to raise it correctly with a great deal of socialization. Answer the Puppy Application truthfully and send to me via email. If you get a puppy from our kennels, you may take it to a Veterinarian to assure that the puppy is in good health, after that YOU are responsible for that puppy for the rest of it's lifetime (except the warranties of the contract) and there will be no refund! Dr. Karen Becker on early spaying/neutering and also over vaccanating a pet..
We feed our dogs and puppies Wholesomes Chicken & Rice Formula. It has no wheat, corn or soy. 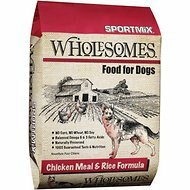 Our dogs and puppies are doing very well on this food, so we recommend it to our buyers to keep the puppies that they buy from us on this food. Finding appropriate and loving homes for our puppies is very important to us. Our dogs are raised to be loving and loyal family companions. Our puppies have outstanding looks with big heads and with lots of expression and intelligence. They are what a true Rottweiler is meant to be... Each of our dogs is given individual attention, care, exercise and training. Early stimulation and continued socialization are very important to the mental development of puppies. Our Puppies are handled the day they are born, and we socialize them with new smells and noises throughout their 8 weeks here. During their eight weeks here they are closely watched to make sure that each puppy is getting the individual attention that he/she needs to develop properly and also that they all have equal opportunity to mother's milk. We also tend to bottle feed them for extra socializing and handling. They get tons of attention from us and our family when they come to visit. At the age of 4 to 5 weeks old, the puppies are taken on short outings where they learn to follow and come when called. We also believe that individual attention away from their littermates is crucial at this time. We try to spend time with each puppy with one on one to socialize it and to get it use to being away from the littermates, which makes it easier on them day by day. 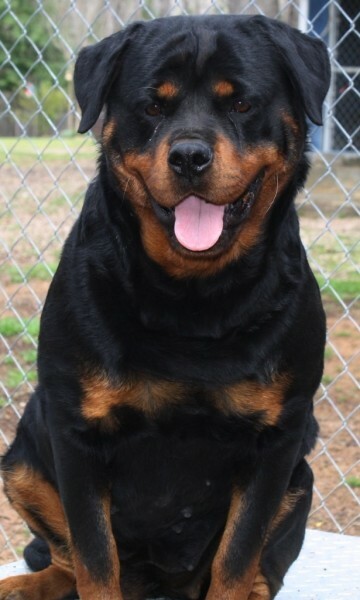 Rottweilers naturally have a strong temperament and early training definitely makes a difference in their life. It is very important that obedience training is continued when the puppies go to their new homes. We get to know each puppy individually and so that we can recommend them to a home that will be a good match with their individual personalities. Please feel free to contact us with any questions that you may have. In the case where our puppy buyers cannot keep their puppy that they bought from us, we get that puppy or dog back and it is enforced in our contract. We are the ones that bred that puppy and we feel like it is our responsibility in placing it in the proper home. We have our dogs X-rayed and certified for their hips. We also enforce it in our contracts if buying a working/breeding dog before they are bred. Breeding any animal is a huge responsibility and should not be done without the proper health clearances, sound temperaments and looks as well as excellent pedigrees. We breed for future show/breeding dogs for our kennels and to bring joy to the lives of others that love the breed. In order to take good care of our dogs and breed Rottweilers of quality, it is extremely expensive. Here at Gold Hill Kennels, raising superior puppies that will bring joy into the lives of their new families is our number one goal. Pups are whelped here in our home and because we both work here at the house, they are able to receive lots of attention and stimulation throughout the day.